It turns out that people not making a choice made the 2014 county commission race less close than it really should have been. And, these voters, if they weigh in this year, could tilt the county commission altogether. I learned something interesting when I started backtracking on my old post about how Bud Blake and how he won an county commission seat in 2012 as an independent. This was interesting to me because in any other year, I think, Blake would have run as a Republican. So how much did party labeling matter? Did Democrats give themselves permission to vote for a conservative independent just because the label wasn't Republican? In my first run, it sure did look that way. I compared percentages of the returns of an aggregate 2012 Republican by precinct compared to Blake's percentages. The chart that was produced showed a narrow band of what would've been Democratic voters in 2012 voting for an Independent (would've been Republican) in 2014. 1. Off year elections in Washington State are not presidential (or gubernatorial elections). There's lower turnout since top of the ticket partisan elections aren't there. In an email Matt Huot even pointed out that there was no federal Senate election in 2012, so the voter pool really had no top of the ticket partisan talisman. 2. Therefore, voting percentages are not voting totals. It really matters how many actual voters fill in your bubble, so comparing a low turnout race to a high turnout race really wouldn't work. So, what I did was backtrack and compare Bud Blake's election in 2012 with what I could put together as a partisan comparison, the combined WA 3 and WA 10 congressional races in Thurston County. And, what I found was amazing. Almost 6,000 voters that made a choice in their congressional election didn't choose between Bud Blake or Karen Valenzuela in the county commission race. And, this is in a year that congressional Democrats dominated congressional Republican candidates in Thurston county, 48k to 33k. The bad news for partisan Democrats is that even if you add all of those undervotes to Valenzuela's totals, she still would have lost by a just over a thousand votes. But, you could imagine if a few things when differently, a thousand votes out of more than 80,000 cast is a distance that can be traveled. So, this year when we're likely seeing two Democrats in county-wide commission races against candidates who esque partisan labels, where would the undervote problem matter most? Good news is that it matters in the precincts that already skew Democrat. This chart ranks precincts by their partisan weight (most conservative to the left). The blue line is Bud Blake's percentages across this spectrum. The red line is Karen Valenzuela's plus undervotes. You can see the problem of undervotes becomes more pronounced in the more liberal precincts. If this year's crop of Democratic commission candidates can convince otherwise Democratic voters to come out, then the independent label problem becomes much smaller. And, in a presidential/gubernatorial/senate year, we can almost be assured that's going to happen. 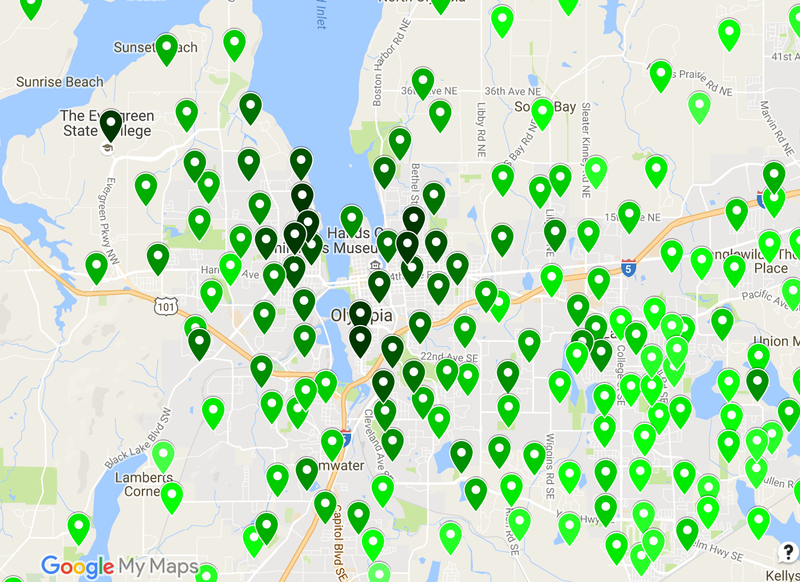 And, just to visualize it another way, you can see that these precincts also focus on Olympia. If these voters come out in the commissioner's race, we'll have a much different ball game than 2014.